One of the oddest looking – and possibly coolest – mobile phones ever, the Serenata was a joint effort between Samsung and Bang & Olufsen, and it created a handset that was quite unlike almost anything else. B&O and Samsung had been here before, with the radical and exceptionally expensive Serene launched in 2005. The Serene was clever in many ways, but it had some severe technical limitations. The Serenata (launched two years later) was probably the phone that the Serene should always have been, but the market had moved on since then. The Serenata copied the Serene by having the display on the bottom (so it didn’t get greasy when making a phone call), but here there was a rotary control for the phone – very much like the iPod. 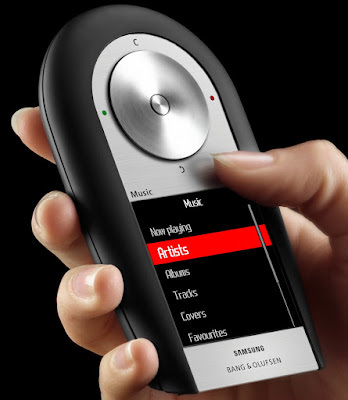 Where the Serene surprisingly lacked music playback features, the Serenata was a proper digital media player with 4GB of storage. 3G data was added, but the Serenata did not come with a camera. Because this as a B&O device, it came with a variety of stylish accessories. It was also extremely expensive at €800, and despite all the cleverness the launch of the iPhone had changed the expectations of consumers. For all its stylish and esoteric charm, the Serenata’s features looked dated compared to what Apple was doing. Although both the Serenata and Serene caused a stir when launched, neither were a sales success. A year after the launch of the Serenate, B&O shuttered their phone business along with several other product lines. But, as with many other rare and unusual phones the Serenata remains quite collectible with good examples selling for around €400 to €500.